Even the messiest of garden's look charming in this spring weather. The soft golden light washes over the new green growth and looks so beautiful, that any unmown grass, unpulled weeds and untrimmed edges go unnoticed in the wake of pretty spring blossoms. Lucky for me. Because there is so much exciting stuff going on this month that those lawns and weeds and edges need to go unnoticed for quite some time more. Already this month I've styled a photo shoot for Feast Magazine - look out for the January issue (although you can check out this month's crumpet recipe to see my granny's crockery). I've worked with my friends at picnic event on their farm. I wish I wasn't so busy so I could take some photos, the weather was gorgeous, the setting idyllic and the food delicious. Then there's a school fair to work on, a school camp to cook for, a market to get cracking on, a website to write for and a summer preserving party to start growing for. In all this busyness, the bee population quietly grew so much that half the hive buzzed off searching for bigger digs. They swarmed. Over the house and off to nether. Half the workforce gone and half the honey harvest taken as rations. Sigh. After wishing them well on their journey, I looked up swarms and came to the conclusion that I am an inattentive beekeeper. Inattentive beekeeper with unmown grass, unpulled weeds and untrimmed edges. That's me. And doesn't it look charming in this glorious spring weather? What a lovely post! We've just got our garden all ready for summer. I'd love to keep bees but we're on a small city block. Our front garden looks terrible because of the long grass and the weeds - I'm sure one day I'll get a note in the letterbox from a testy neighbour with a telling off for not keeping it better manicured! Your garden looks adorable! I'd love to have a beehive - don't think the neighbours in my Sydney apartment block would fancy my having them on my balcony though. Your garden looks lovely & productive Michelle...good luck with all your projects! I am so enjoying our garden at the moment. It's rained today which is a bonus because I've been away and haven't been able to give the beds a good soak - though it's often with buckets from the household cleaning. 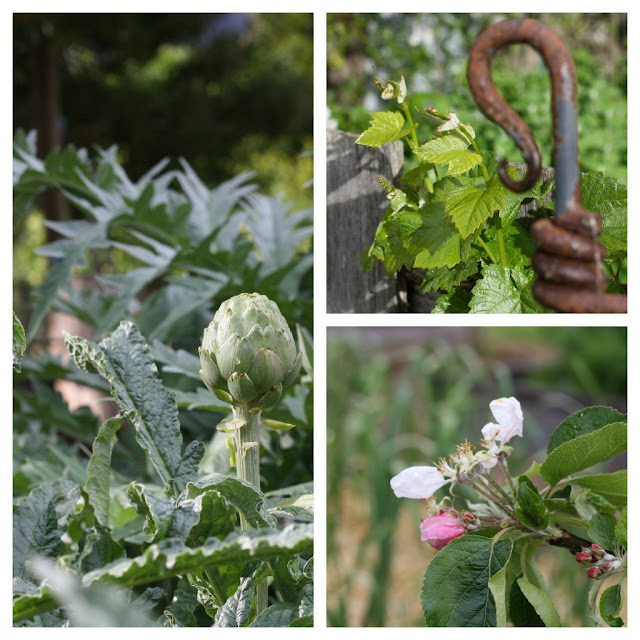 It is lovely to see all the greenery in our garden, and it's true you don't see the weeds so much...Rob's been bringing out the scythe, but needs to fix the handle a little as one bit keeps falling off and annoying him. 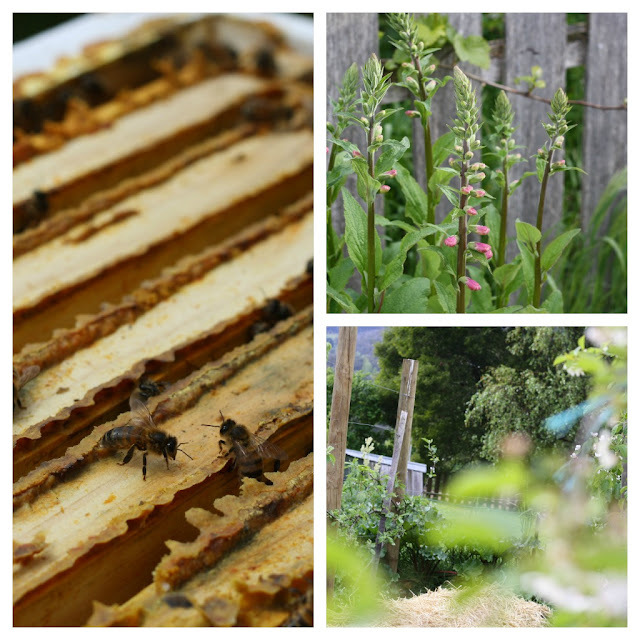 It does sound like a busy time for you, and that summer preserving party sounds intriguing! Hope you have an excellent time at the school camp and in Canberra, can't wait to see what you get up to. Gosh, you are busy, but busy with such GOOD stuff! I'm sorry to hear about the bees, but your rambling looks wonderful. Unmown grass, unpulled weeds, untrimmed edges and all! Your garden looks beautiful :) But can I say... ferral bees are actually a real problem in Australia, and I hope you did your best to recapture the swarm. If left to their own devices the swarm will choose a nice new home to live in, but they may then compete with native birds for habitat, pollinate and spread weed species, and take nectar from native flowers without pollinating them, displacing native bees. Sorry if I am telling you what you already know.